Vintage 1951 Photograph, Reg Parnell on Ferrari 375 Thinwall Special, Goodwood Trophy 1951. 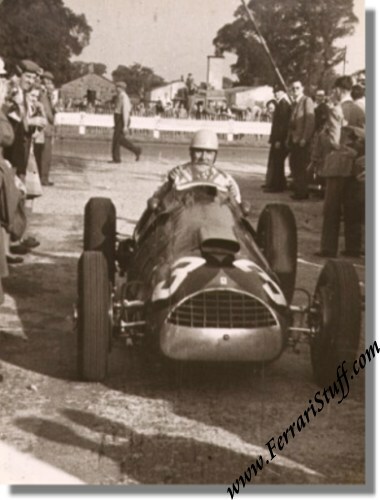 This is a good size vintage photo of Reg Parnell in the Ferrari 375 Thinwall Special prior to the 1951 Goodwood Trophy at Goodwood race track in the UK. Reg would finish the race in second place behind Nino Farina on Alfa Romeo 158. The photo measures some 8 x 6 inches or 20 x 15 cm and is in good condition (bar a slightly bent corner in the extreme lower right edge), there are a few slight marks from the original negative that had suffered from the film transporting mechanism. It is also a big enlargement from part of the negative so it is a bit grainy but nevertheless a great vintage print from a by-gone era.